Figure 2. Molecular phylogenetic estimate of major ceratobatrachid relationships based on maximum likelihood analysis of two mitochondrial gene partitions (12S–16S) and three nuclear genes (proopiomelanocortin, recombinase activating gene 1, and tyrosinase; 11-partition model: Table 2). Maximum likelihood bootstrap and Bayesian posterior probability values are included. Boxed letters denoting selected nodes of interest are discussed in the text. Node B is Ceratobatrachidae. As illustrated, the tree is unrooted, and to save space the outgroups (Node A) are shown as if they form a clade, which they do not. The root of the tree lies on the branch between Kaloula and all other taxa. Photographs of selected species are included (approximately to scale), with current taxonomy summarized at tree tips (compare with revised taxonomy, summarized in Fig. 3). Nodal support: black dots ≥ 0.95 and ≥ 70 maximum likelihood bootstrap support (MLBS); grey dots ≥ 0.75, posterior probabilities (PP) ≤ 0.95, and ≥ 50 MLBS ≤ 70. Support values provided (as MLBS/PP) for weakly supported nodes and nodes with disparate levels of support between analyses. 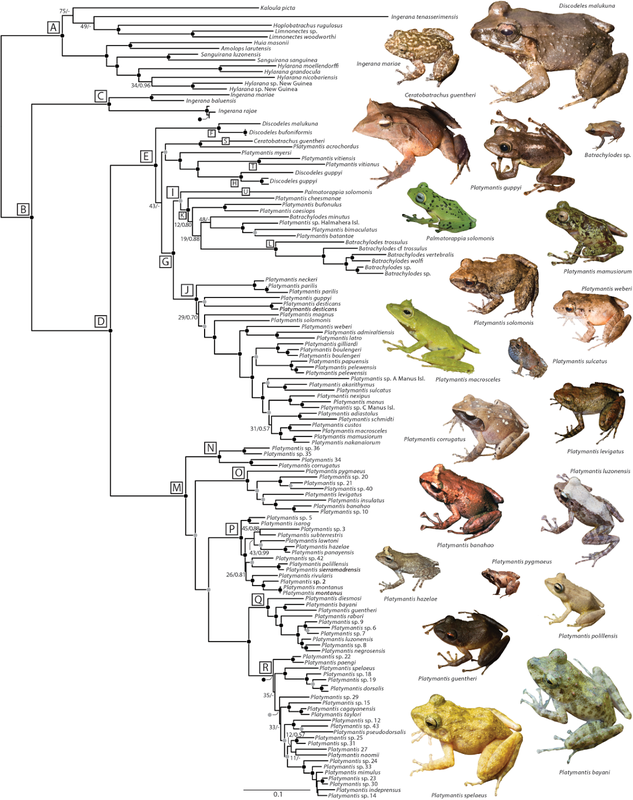 We present a near comprehensive, densely sampled, multilocus phylogenetic estimate of species relationships within the anuran family Ceratobatrachidae, a morphologically and ecologically diverse group of frogs from the island archipelagos of Southeast Asia and the South-West Pacific. Ceratobatrachid frogs consist of three clades: a small clade of enigmatic, primarily high-elevation, semi-aquatic Sundaland species currently assigned to Ingerana (for which we erect a new genus), which is the sister taxon of two large, monophyletic radiations, each situated on islands on either side of Wallace's Line. One radiation is composed of Philippine species of Platymantis and the other contains all taxa from the eastern Indonesian, New Guinean, Solomon, Bismarck, and Fijian archipelagos. Several additional genera (Batrachylodes, Discodeles, Ceratobatrachus, and Palmatorappia) are nested within Platymantis, and of these Batrachylodes and Discodeles are nonmonophyletic. To address the widespread paraphyly of the genus Platymantis and several additional nomenclatural issues, we undertook a wholesale nomenclatural reorganization of the family. Given our partially unresolved phylogeny, and in order to impart a conservative, stable taxonomy, involving a minimal number of genus-species couplet changes, we propose a conservative classification representing a few compromises. These changes are designed to preserve maximally the presumed original intent of taxonomy (widely used group names associated with morphological and ecological diversity of particular species or groups of species) while implementing a hierarchical system that is consistent with the estimate of phylogeny based on new molecular data. Figure 1. Distribution of the frog family Ceratobatrachidae. Numbers of species per major region are included in parentheses. ป้ายกำกับ: 2015, Anura - Frog, Asia, Borneo, Ceratobatrachidae, Herpetology - Frog; Reptile Snake, Indonesia, Melanesia, New Genus, Philippines, Southeast Asia, Subgenus, Sundaland, Taxonomy, Zool. J. Linn. Soc.